We have some great news to share on the Medicare CGM Access Act! Late yesterday, Representatives Tom Reed, Dianne DeGette and Ed Whitfield introduced companion legislation into the House of Representatives. As you’ll likely remember, back in July Senators Susan Collins and Jeanne Shaheen introduced nearly identical legislation to ensure access to CGM technology for people on Medicare. We can’t thank you enough for all the wonderful social media activity you’ve created to drive the community to urge their Senators to co-sponsor the bill. However, as you likely know, in order for a bill to become a law, it must be passed in both the Senate and the House before going to the President to sign or veto. So, this “companion bill”, which is nearly identical in content with a new number (HR 5644), is a key step in the legislative process. Of course, this means it’s time to rally the community again, urging people with diabetes along with their friends and family to encourage their local Representatives (as well as their Senators) co-sponsor the legislation. Once again, JDRF has provided great resources where people can read about the issue as well as identify and easily contact their own Representatives and Senators. You can find these resources here. You can also feel free to share our blog post. For those on Medicare and those of us soon to be there, this is hugely important. My CGM has been life-changing and I believe that it keeps me safe and improves my blood glucose profile on a daily basis. My co-blogger Sue from Pennsylvania has repeatedly shared the nightmare that she lives in because of the non-coverage of her husband’s CGM by Medicare. Contact your U.S. Representative to ask him/her to co-sponsor H.R. 5644 and advocate for seniors with diabetes who require a CGM. If you have not already done so, contact your Senators to co-sponsor S. 2689 and advocate for seniors with diabetes who require a CGM. Sign the JDRF petition: Tell Medicare to Cover Continuous Glucose Monitors for People with Diabetes. As of 9/21/14 the petition has 56,618 signatures and we hope to reach 100,000 signatures. Forward my blog to your friends and family urging them to take action. If you are a blogger, please share this with your readers. If you would like to copy my blogpost word for word, please do so! The links provided by JDRF make it simple to contact your Senators and Representative. By filling in your name and address, your appeal is automatically sent to the correct government officials. You are able to personalize your message by adding a few sentences to explain why this is important to you. I used to be worried about trying to be an advocate. JDRF has streamlined the process and made it “easy-peasy.” You can complete Steps 1-3 in about 5 minutes. I thank you for reading this. More importantly, I thank you for contacting your elected officials to help ensure that your fellow Americans on Medicare have access to continuous glucose monitors. If there is anyway that I can help you, please contact me. I have been advocating for over two years for Medicare to cover a Continuous Glucose Monitor (CGM) for my husband Marc. Synopsis – he had been covered for the CGM when he had private insurance through his employer, but when he turned 65 and became Medicare eligible, and needed a replacement CGM, it was denied. Medicare considers the CGM precautionary and therefore, in their opinion, not necessary. Of course, those who desperately need one disagree with this. The first denial came in August of 2012 and shortly thereafter, we started the long and exhausting appeals process. When we got to Level 3, a hearing by an Administrative Law Judge (ALJ), it took almost nine months after our June 26, 2013 hearing for the Judge to render an UNFAVORABLE decision. We decided to go on to Level 4 which is a hearing with the Medicare Appeals Council (MAC). They have the power to overturn the Judge’s decision. This Appeal was submitted to them in April of 2014. We are now in the 5th month of waiting for the Council to make a decision. The Appeals process is almost like watching a tortoise cross the road. It’s very, very slow. In the meantime, Marc, after 45 years, decided to apply for VA benefits. He had served in the United States Air Force for four years but had never thought of getting any benefits through the VA. From the time he submitted his first application to when they processed him in took almost two years (nothing we do happens quickly). Finally, in May of this year, he became a part of the VA. He had to go through all types of exams, one of which was with the VA endocrinologist. In checking his A1c and hearing about his problem with hypoglycemia unawareness, she definitely thought that he needed a CGM and prescribed one for him. However, as with Medicare, we were told that the wait to get one was 1 – 2 years. For some reason, and I can only guess it was because he had so many instances of blacking out, she went to bat for him and I can finally say, HE HAS A CGM! Two weeks after speaking to her, he received an email from Dexcom that his CGM was on its way. Four days later it came. To say that we are thrilled is putting it mildly. Our two years without a CGM are finally over. For myself, I can now be at peace during the day when Marc at work knowing that if his sugar starts to drop rapidly, he’ll get those warning beeps. And I welcome those beeps at night (which used to drive me crazy) because now I can sleep better (in between the beeping) knowing that we’ll have time to correct the situation before I have to go running for the Glucagon. When I became an advocate for his CGM, I made a commitment to continue to fight for Medicare to make a change in their guideline even if Marc did eventually get a CGM, whether through Medicare or some other source. I intend to keep that commitment and will continue to work towards that goal. To that end, we are letting the Level 4 Appeal play out even though, if we are fortunate enough to get a FAVORABLE decision, we can no longer get a CGM through Medicare. It is our hope that if anyone who is thinking of going through the process will see that it is possible (I hope) to get a good decision and soldier on. No one should have to go through what we’ve gone through in the past two years to get a piece of equipment that is so life-saving. If you are a Veteran and have not joined the VA, you might want to consider applying for benefits whether you are a diabetic or not. In the past four months, not only have they covered Marc’s CGM and sensors, but also Symlin, which is a synthetic aid in lowering blood sugar and is quite costly, his cholesterol medication, syringes, etc. In a future blog, I will give you a few hints about joining that might make it easier to navigate the VA, one of which is to contact your local County Veterans Service Officers. They are most helpful. Last week I spent two hours updating my Blogroll. The process began with a print-out of my current blogroll which I compared to my bookmarks for diabetes blogs in Safari. I found about 25 bookmarks which needed to be added to the list. One by one I typed in the name of each new blog and embedded the link to the website. I had known for months that I needed to work on my blogroll, but the chore stayed at the bottom of my To-Do list. What inspired me to finally tackle the project was the Wednesday, Sept. 3 DSMA TweetChat. The subject was whether the Diabetes Online Community (DOC) should have a governing body along with standards of conduct and lots of rules. No one seemed to think that was a good idea and the discussion moved to the topic of helping newcomers to the DOC find a foothold in the maze of diabetes social media. Blogrolls were mentioned. Blogrolls show up in many different forms. Some like mine are long lists by category (Type 1, Type 2, Parent) with no description or rating of the blogs. Others are shorter lists with titles such as “My Favorite Blogs” or “DOC Friends”. One of my favorite blogrolls is by Scott at Rolling in the D because he has personalized his list with brief and occasionally witty descriptions of each blog/blogger. A nice feature on Blogger sites is a “live” blogroll that automatically updates with recently published posts. Many DOC writers have chosen to not have blogrolls at all. What is the purpose of a blogroll? When I began reading diabetes blogs many years ago, blogrolls were a magical pathway to “meeting” other people with diabetes. Without Twitter and Facebook, there was really no other way to learn about other websites. The first blog I read was either Scott’s or Kerri’s and then it was a dot-to-dot adventure finding other people sharing their stories. My guess is that newcomers to the Diabetes Online Community (DOC) still use blogrolls in this fashion while most blogrolls are largely ignored. My blogroll had about 200 views in the last year. I hope that some viewers used my list to find other blogs. Unfortunately I suspect that most of the views were just by other bloggers seeing if they were on the list! The main reason that blogrolls are impossible to keep current is because there are now hundreds of diabetes blogs and new ones appearing all of the time. If you check out most blogrolls, you will find a dated list that highlights many established D-blogs while including few new blogs and being littered with many blogs that have been abandoned for years. As an experiment, I checked out the blogrolls of the first twenty blogs listed in my Safari bookmarks. I chose 3 favorite blogs in addition to my own to see if they were listed in any blogrolls. 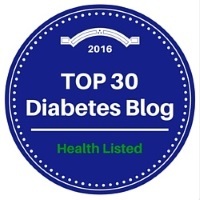 These 3 blogs are by prolific Type 1 writers who like me have been around for about 1-1/2 to 2-1/2 years. Of the twenty blogs I checked out, 5 did not have blogrolls. My blog was listed on 5 out of the remaining 15 blogrolls. Another fantastic newish blog was listed on only 3 blogrolls. One was seen on 6 out of 15 and the last one had more presence being on 9 out of 15 blogrolls. These stats are not meant to criticize anyone; rather they emphasize how flawed most blogrolls are. Even if you are able to keep adding all of the new blogs, when do you take an inactive blog off the list? The ultimate criteria is probably when the link doesn’t work anymore. But how old is too old? When blogrolls were mentioned in the September 3 DSMA TweetChat, Scott Johnson immediately tossed out the question of the day. Typical of DSMA, the discussion quickly went off-topic and morphed into shrimp rolls and carb counts. How do I feel about this? On one hand, it is frustrating to be left off lists by people whom I know read my blog regularly. At the same time, I know that it is meaningless because I don’t think blogrolls are used for much of anything and most of us rarely look at them. So after this post I think I will go back to totally ignoring them. Back to the September 3 DSMA TweetChat. Although I don’t believe that the DOC needs a governing board or rules, I wonder if something like a DBlog Central website would be useful. This site could maintain a complete and updated blogroll with descriptions and tags to help users navigate the DOC. A central website could also be a hub for sharing information with all diabetes bloggers on things like starting a blog, finding diabetes graphics, Twitter names, current campaigns of the DOC such as Spare a Rose, and a calendar of events. I can’t envision how something like this could be created. Maybe we should have a governing board for the DOC and “they” could set up the website…. Yeah, right! I think that most of us would say that the magic of the DOC comes from its somewhat chaotic nature and no one wants to regulate its constant evolution. Why should we change something that isn’t broken? In the meantime I plan to continue to have a blogroll. If you’re not on it and would like to be, please contact me. Thank you once again to Laddie for me inviting me to blog at her site and especially for encouraging me to blog about arthritis. While I traditionally blog at TuDiabetes and have been a type 1 diabetic for 40+ years now, I also have Rheumatoid Arthritis (RA). The connection between the two diseases is always fascinating to me. I decided to stretch Laddie’s invitation to a three-part blog about RA. In the first blog, I told of how I was diagnosed; today, I write of my personal path with RA; and the third blog will be a discussion of how RA and diabetes are related. While sequentially written, each one stands apart and can be read independent of the others. I hope you find meaning in my experience. If you wish, I am available to answer questions. I am not an expert, but I have had an interesting life with the two diseases. The first line of drug defense is methotrexate. It is inexpensive, readily available, and a proven agent; although, with some downsides. One downside is that it does not always work. In fact, in most cases today, doctors want to move patients with RA to the more aggressive biologic drugs. You know these by the brand names: Enbrel, Remicade, Humira, and the secondary drug Orencia. Each is administered via injection or infusion. I prefer infusion, but most people prefer the injectable varieties. These drugs, along with a host of others, target proteins linked to the TNF alpha gene (tumor necrosis factor alpha). This gene belongs to a superfamily of genes defined as “a protein currently consisting of 19 ligands and 29 receptors in humans” (“TNF Superfamily,” 2014). This superfamily is thought to be involved in many types of diseases, including cancer (“TNF Superfamily,” 2014). In fact, the class of drugs used to treat RA mostly came out of cancer research. To read more about the TNF Superfamily, click here. The doctor told me on the very first day that if I wished to continue to function, I must go to a biologic drug as soon as humanly possible. That meant using methotrexate or a similar drug (Arava) alone for six months, then testing and going to a biologic immediately. Those first six months were pretty tough. My disease continued to worsen, and by the end of it I was barely walking. So, my first “big gun drug” (as my doctor called it) was Remicade. I used this for almost 5 years and it was amazing. It absolutely stopped the progression of RA in its tracks. That is, until it didn’t. Over time, the frequency of doses began to get closer, and then it simply stopped working. When it did, I moved on to a succession of five biologic drugs; four of which did not work, or worked only slightly, until they stopped altogether. This is not uncommon for RA patients. In fact, if you talk to RA patients who have had the disease for some time, many have been on every “big gun drug” out there. I have been on many, but not all. With the development of the lupus-like syndrome, I was forced to go on a different, potentially toxic, form of treatment using the drug Rituxan. At the time, it was my last stop on the available drug merry-go-round. The problem with Rituxan in particular is that during the clinical trials, people died. So, the first time one takes it is very scary. Doctors cannot predict who may be affected or when, but death is rare so it is unlikely the lights will simply go out. With my experience with other drug side effects, it was a troubling decision to use the drug. I put off the decision for about four months before I agreed. During that time, my condition worsened and I was barely moving; sometimes during this time frame I returned to using a cane for walking. I was once again a mess. Today, my disease is managed with infusions every four months. 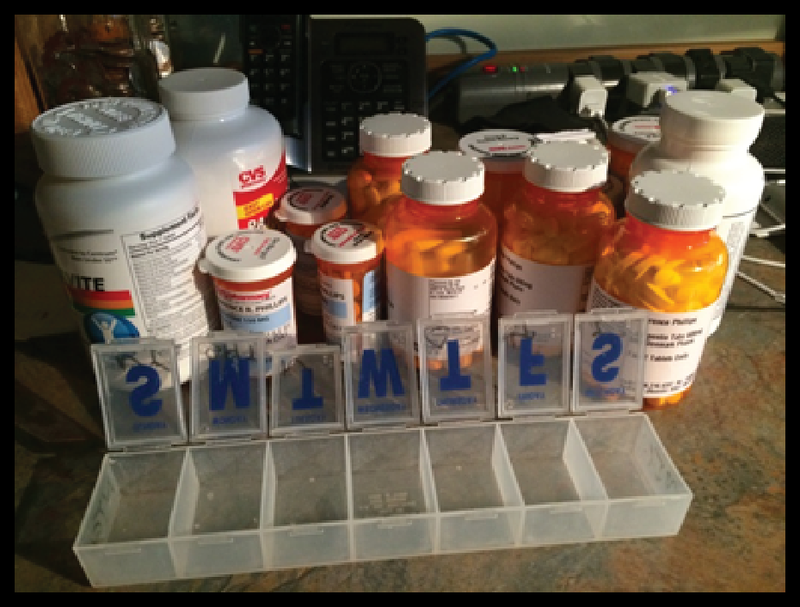 With constant appointments with the rheumatologist and a variety of secondary drugs, I am able to semi-manage RA. I say semi-manage because I have had to stop working, I have periodic flares, and of course stamina is a big concern. The truth is that no one really manages aggressive RA. Instead, it is a series of highs and lows. Some days you feel well, other days you feel terrible. But with the assistance of biologic drugs, it is possible to live, albeit some days on a tight rope. I have had no serious side effects using Rituxan, and while I am on the maximum allowable dose, the doctor and I are thinking we might have a chance to stretch the infusion intervals a bit in the future. The drug is intended to be used on a six month cycle, with four months being the shortest cycle. I am on a four month cycle at this moment, and doing well. I also take an unreasonable number of drugs, in addition to the Rituxian. Now, to be fair, most of these are not related to RA. But, many are. 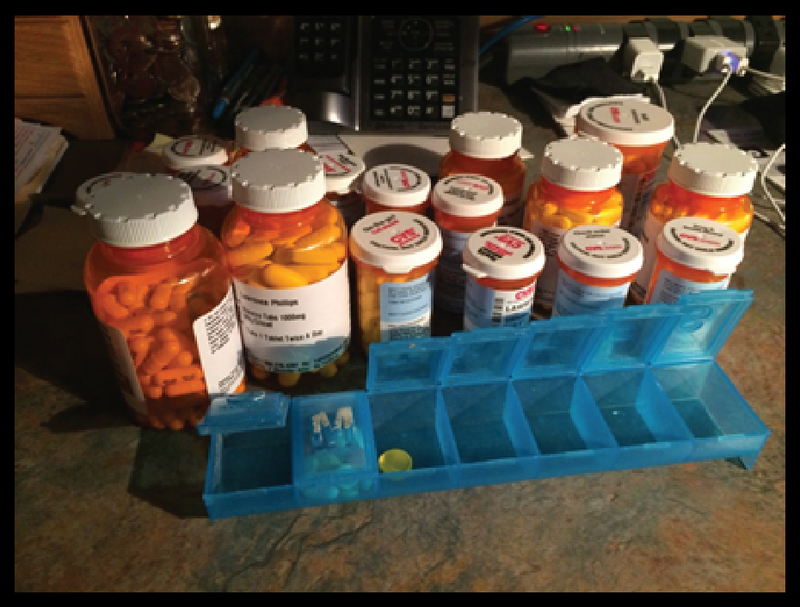 To give you an idea of my drug regimen, I have included two pictures that demonstrate the number of medications I use: one for morning meds and one for evening meds. Yes, I know it is a lot. First, thank you to Laddie for me inviting me to blog at her site, and especially encouraging me to blog about a subject that interests me greatly: arthritis. While I traditionally blog at TuDiabetes and have been a type 1 diabetic for 40+ years now, I also have Rheumatoid Arthritis (RA). The connection between the two diseases is always fascinating to me. I decided to stretch Laddie’s invitation to a three-part blog about RA. In the first blog, I tell of how I was diagnosed; in the second, I will write of my personal path with RA; and the third blog will be a discussion of how RA and diabetes are related. While sequentially written, each one stands apart and can be read independently of the others. I hope you find meaning in my experience. If you wish, I am available to answer questions. I am not an expert, but I have had an interesting life with the two diseases. While I have told my diabetic diagnosis story a number of times, I seldom get to tell my RA diagnosis story. I was officially diagnosed with RA in early spring of 2000. Looking back on things, I likely had it longer. (My best guess, around 1997.) But, like most things that sneak up on you, I had no idea that most people didn’t feel that bad. The turning point came in two parts. The first, was in the late summer of 1999 when my oldest son bought a 1999 Pontiac Firebird. It was truly a beautiful car. My wife nicknamed it The Beast for its thunderous engine, high end stereo, and awesome looks. He brought the car home; proud, as he should have been, and he offered rides. I could not go because I simply could not get in. The car was too low to the ground and I was much too stiff to bend. Not riding in his new car, of which he was legitimately very proud, hurt my son’s feelings and I went inside and had a good cry. The second involved my youngest son when I took him for a campus visit at the one college I love: Indiana University Bloomington. While he and all of the other parents and prospective students toured the campus that late winter day, I stayed behind, sipping coffee in the lounge. I was the only parent to do so. There was no way I could walk and keep pace, let alone walk the distance required for the tour. Now mind you, it was a lovely day at a campus that I have always admired and I was with my son who was enthusiastic to be there. If ever a day was made for a parent to enjoy a brief walking tour, this was it. When I could not go, I told him and myself that I was letting him go alone because it was a part of growing up. In truth, it was the final step in recognition of the fact that something brutally wrong was going on in my body. Later when asked what tipped the balance, I would often say it was the ride to and from campus. On both the way there and back, I had to get out of the car to stretch because my legs hurt so much. It was a 60 mile, one hour drive each way. Today, post treatment, I routinely make this drive without stopping or issue. It seems silly now that I stopped twice that particular day. With that second affront to one of my sons, I knew I had to do something. So when I saw my endocrinologist, we discussed it and he ordered some tests. In short order, the hidden truth was revealed. My indicators for RA were simply off the charts and immediate action was required. Within a few days, I saw a rheumatologist and the cycle started. My insurance company required that the first course of medication involve the exclusive use of Methotrexate. Almost immediately, my mouth broke out in sores and I went to a newer drug, Arava. This one also caused mouth sores, but was effective at a lower dose. With the use of these drugs, I started monthly blood monitoring, something I was not as compliant with as I should have been. By the end of the sixth month, my doctor received insurance approval to move to biologic drugs. Being diagnosed with RA was an awful punch to the gut. I had learned to live with Type 1 diabetes, despite being very angry about having the disease. With use of insulin therapy, I was able to somewhat make peace with the disease. With the addition of RA, life certainly got more complicated. First, it meant extensive blood work. Instead of going every three months for an A1C, I was now going one to three times per month to check blood levels for RA factor and various blood chemicals. It was doubly important to keep up with the blood work because too much of the immune suppressants could ultimately be deadly. Just as important, I also faced a new reality with work. I loved the job I was doing at the time. Men are often self-defined by their job and I was no different. But with the diagnosis of RA, I somehow knew that life would change. At 42, it was truly the beginning of the end of my work life and what I defined as Me. Yes, I was scared, but thank goodness I have a wonderful partner in Sheryl who helped me keep the train on the tracks for a few years. Rick Phillips might be one of the busiest people in the Diabetes Online Community (DOC). The easiest place to find him is at TuDiabetes. He hangs out there under the name of “Rick the Blogabetic” and is an active blogger, forum participant, and member of the Care Team. I truly love this site [TuDiabetes] and over the last few weeks I come to love it even more than today. Thank you so much for asking. It means a lot to me and if the reader of this post is ever asked and they accept the challenge, they will find a new way to serve you fellow diabetics and believe me it is so worthwhile. Rick decided in late April 2013 that he needed to do something that was mega-impactful and he pledged to write 200 blogposts in one calendar year. Thus was created Rick the Blogabetic. Rick is somewhat like me in that he never uses one word when ten will do. Therefore his 200 posts represent a tremendous amount of writing and research on a vast array of subjects. You can read about anything from “Dogs and Endocrinologists” to the whimsical story of “Chick Duck” and from “What is -30-” to “When are We Not Diabetic?” To learn more about Rick, you should read his 199th post in which he described what he learned as a result of his blogging marathon. BTW Rick the Blogabetic is still going strong although maybe not at the pace of 200 posts per year. In recent weeks I have run into Rick at TuDiabetes both in the forums and on his blog. I have read his guest-post at Karen Graffeo’s blog Bitter Sweet™ where he compares diabetes education to spring rains. I have seen him (@LawrPhil) in the thick of the controlled mayhem of #DSMA TwitterChat on Wednesday evenings. Facebook? Yes, he’s there too. So if you don’t already know Rick, chances are you will soon! Rick and I have a lot in common. He has had Type 1 for 40 years compared to my 38 years. He is somewhat younger than I am, but we have been married approximately the same length of time and our two sons are the same age. Even our grandchildren are close in age. We both live with multiple autoimmune conditions. Here things diverge. Rick lives with severe Rheumatoid Arthritis (RA) that has had a huge impact on his life. He indicates that his arthritis is much more difficult to live with than diabetes and that the severity of his arthritis required him to abandon the career he loved in education/business/public affairs. Although I also have arthritis, mine is more easily managed and has not yet required me to make significant changes to my lifestyle. Next week Rick will be guest-blogging at Test Guess and Go about the connection between Type 1 diabetes and Rheumatoid Arthritis (RA). Because many of us with one autoimmune condition have clusters of autoimmune issues, this 3-part series should be an interesting and educational read. Rick will tell his personal story in Part 1, talk about his treatment regimen in Part 2, and conclude with a somewhat scientific discussion of the links between diabetes and RA in Part 3. Thank-you to Rick for taking time to share his story with us. I encourage those of you reading this blogpost to take time to get to know Rick in the many social media platforms of the DOC. You will quickly learn that he is a Diabetes Advocate to the core and that he is a man dedicated to serving others. Those of us with diabetes are lucky to have him on our team.